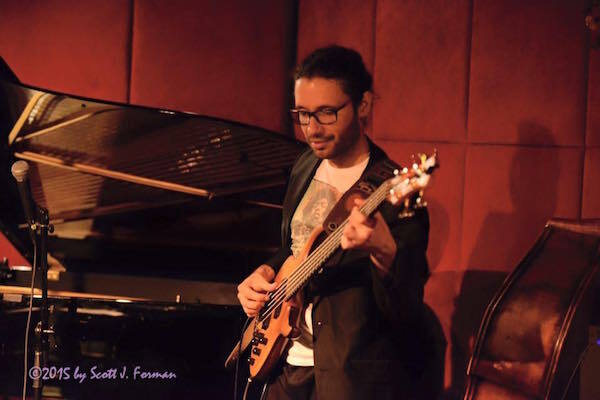 Bassist Ricardo Rodriguez is part of the jazz scene in NYC, which embraces the entire scope of contemporary music. Besides being an in-demand jazz bassist, he can be found playing jazz, contemporary music, Afro-Caribbean or folkloric latin music. He studied classical bass and composition at the Conservatory of Music in Puerto Rico. In addition to his work with Joe Locke and Force of Four, Ignacio Berroa Quartet, Claudia Acuña, Magos Herrera , The Wayne Escoffery Quintet, The Rodriguez’s Brothers, David Sanchez Quartet, Miguel Zenon Quartet, The Kenny Werner/David Sanchez Quartet and his own Quintet also he has played with Branford Marsalis, Donny McCaslin trio, The 90 Miles Project with Stefon Harris, David Sanchez and Christian Scott, Wayne Escoffery Quintet, Manuel Valera Group, Michele Rosewoman, Billy Drummond among others..
Ricky Rodriguez & The New Electro-Acoustic Group at Terraza 7 on Friday October 2nd, 2015 at 10:30 pm.